As the director of The Caucasian Chalk Circle, Dr. Wang Xiaoying states, this Black Swan/National Theatre of China production collaboration is 'an ancient Chinese story, written by a classic German playwright, performed by an Australian troupe', and is a 'collision and fusion of different cultures'. This cross-cultural engagement goes even further, extending to the musicians, designers, and production staff. The attempt to create a theatrical blending of cultures is the most interesting and fascinating aspect of this collaboration between Australia and China. A great deal of money and effort has gone into this production; fourteen government agencies, sponsors, and philanthropic groups have supported it. As successful as this 'collision and fusion' appears to be on the diplomatic or business stage, its success on the performance stage was less clear. As we enter the auditorium, actors in black T-shirts and leggings perform warm up exercises and practise gestures referencing Chinese Opera. The stage is set in a casual way with two racks holding a total of eighty costumes on either side, and shelves with sixty-one Chinese Opera masks in the centre. In the exposed wings of the stage, lighting towers dominate. These are classic Brechtian epic theatre devices: showing the mechanics of a performance distances the audience from an emotional connection to the characters. We are watching a play, but are being asked to think about it in a non-empathic way, and not to lose ourselves emotionally within it (an Aristotelian expectation). The original text of The Caucasian Chalk Circle, which was premièred in Minnesota in 1948, opens with a dispute between goatherds who have lived in the valley for generations, and fruit growers who wish to farm there. 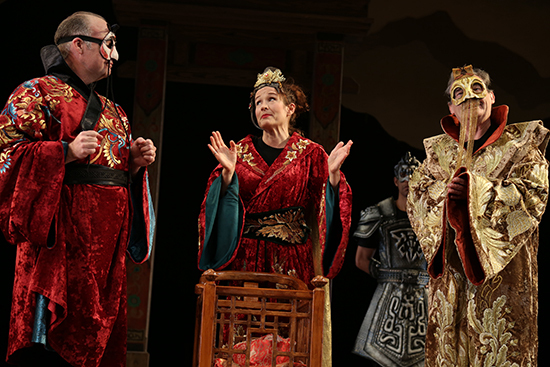 To resolve this, a play is performed based on a thirteenth-century Yuan dynasty Chinese play, The Chalk Circle. In Brecht's version, the story of this 'play-within-a-play' is told in two parts. The first part shows the rescue of a child of noble birth, Michael, by a kitchen maid, Grusha. If he is discovered he will be killed during the rebellion against his father, the governor. At great cost to herself, Grusha protects the child until the war ends. With a subversion of our expectations so typical of Brecht, we are told 'Terrible is the temptation to do good', and we know this act will have consequences. The second part of the story revolves around Azdak, a local villager who becomes a judge on the whim of the soldiers and who has a unique way of delivering justice. After the war, when the governor's wife wants her son returned, Azdak presides, and Grusha's compassion for the child is tested against her desire to keep him. Without an obvious cue (such as a lighting change), Lynette Narkle starts to narrate the play through song, accompanied by the excellent musicianship of Clint Bracknell and Arunachala. We then jump straight into Grusha's story as the opening scene with the goatherds and fruit-growers has been omitted. During the McCarthy era in the United States of America, this scene, with its communist sentiments, was often omitted. This may be problematic for those watching the play for the first time; they may not appreciate that the farmers' dispute reflects Grusha's dilemma, and that one of Brecht's political intentions was that the greater good must prevail. Politics is not only at the heart of Brecht's work, but also at the heart of this collaboration. Cultural diplomacy is an admirable endeavour, but it could be argued that it is an aside to the creative output. To present cultures in this blended manner tells us little about our cultural connections or challenges. Artistic interrogations require more than merely demonstrating a respect for cultural traditions. This may account for the variable performances, with some actors moving well, others speaking well, and only occasionally both. Alison van Reeken, Caitlin Beresford-Ord, and Luke Hewitt were consistently excellent, and Geoff Kelso in the comic role of Azdak was effective. Apart from Alex Malone as Grusha, who also played a small role as a beggar, the actors assumed between four and eight roles. The demands placed on the performers to learn a potted version of Chinese Opera techniques, including work with masks, and to create a range of characters in the Brechtian style, may have required longer than the five weeks' rehearsal period, particularly for some of the younger performers. Malone, a recent WAAPA graduate, was charming as Grusha in the love scenes, but her performance only hinted at the heroic determination needed to carry this iconic role. The visual elements of the production were outstanding. The colour and texture of the masks (Zhang Huaxiang) and costumes (Zhao Yan) were captivating, and the stunning triple-layered backdrop was extremely effective. This scenography evoked multiple references within the play, such as the coarse linen Michael is wrapped in to save him from discovery, or the paper that is used for Chinese calligraphy. At the same time, it presented a mountainous terrain, a snowy landscape, and a flame-filled sky. Set designer, Richard Roberts, is to be commended for achieving so much using simple lines, possibly inspired by Chinese paintings. 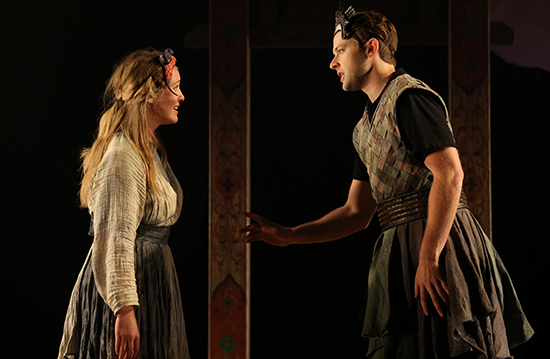 The Caucasian Chalk Circle is driven by sung narration; music is an essential element of any production. The original songs were composed, and many were performed, by Bracknell, seated with a guitar at the side of the stage. The subtle percussion of Arunachala accompanied him, drawing on influences from many cultural traditions. If the songs formed the fabric of the play, then the percussion was the delicate but essential stitching that held it all together. Black Swan State Theatre Company and the National Theatre of China are to be commended for undertaking such a massive cultural exchange. Bringing two sophisticated and embedded theatrical traditions together was always going to be a challenge. This production has opened the way for future collaborations, and it is to be hoped that further cross-cultural collisions and fusions will be developed and refined producing a unique theatrical language. The Caucasian Chalk Circle by Bertolt Brecht, translated by Ralph Manheim, is presented by Black Swan State Theatre Company in collaboration with the National Theatre of China. It continues until 14 August 2016 at the Heath Ledger Theatre.